Launched in the 1980’s, Cheetos has been a favourite snack with kids ever since. 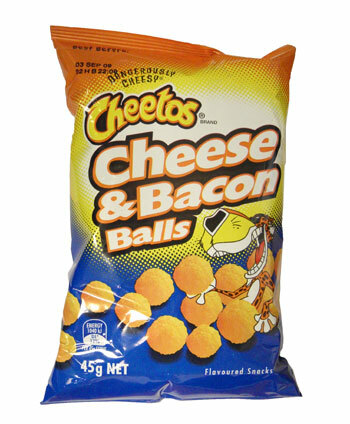 Puffed corn balls covered in a great cheese and bacon flavouring, a great snack anytime of the day! Corn, Palm Oil, Wheat Flour, Whey Powder (Milk), Milk Powder, Cheese Powder (Milk), Salt, Flavour Enhancer (E621), Mineral Salt (Potassium Chloride), Maltodextrin, Flavours, Natural Colours (Paprika Extract, Turmeric), Food Acids (Lactic Acid). Contains Gluten, Contains Milk or Milk Products, Contains Soybeans or Soybean Products.